August was a hot month in Minnesota. There were several times when our heat index rose to the 100+ degree level. On a couple of those weekends, I was shocked to hear that Ryan’s soccer league wasn’t cancelling games and my super-dedicated husband willingly played in that oppressive heat. At least he’s a goalie so he could hang back and watch as his teammates risked heat stroke for the thrill of the score. Murphy and I played it safe and stayed home, tucked inside in the cool comfort of central air. I decided to dive into The Found Recipe Box in search of some relief from our summer heat wave. Ironically, I flipped right past all the frozen desserts, the puddings and the fruit recipes and for some reason, was drawn to the gingerbread. There are two recipes for gingerbread in the box and they have always piqued my interest. 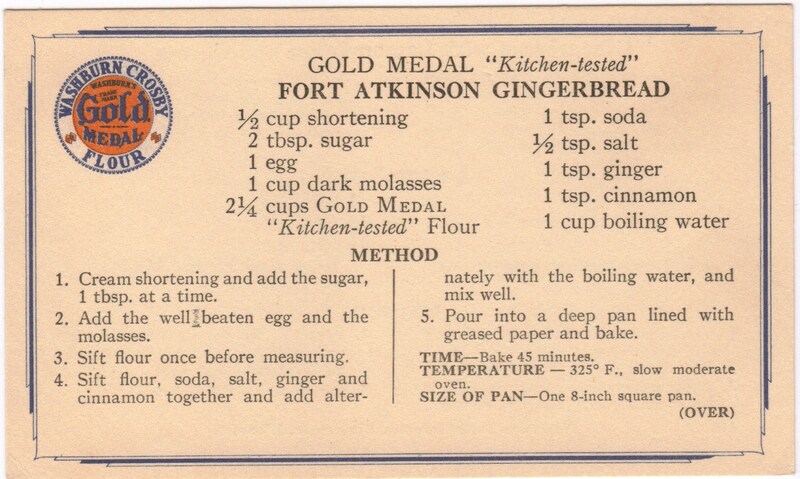 I’m a huge fan of gingerbread cookies, but have never tasted a loaf of actual gingerbread, so I chose the card for Fort Atkinson Gingerbread and began to gather ingredients. Unfortunately, this recipe required turning on the oven, but the word “gingerbread” conjured sweet memories of the Christmas season, little white flickering lights, and a blanket of snow over my backyard that seemed to instantly cool me down. More of these memories flooded my brain as I pulled ginger and cinnamon out of the cabinet. There’s something about that combination of aromas that instantly transports me to my parents’ living room where a tree is brightly decorated and even though he no longer works, the talking Teddy Ruxpin bear from my childhood still ceremoniously takes his place beneath the tree waiting to tell holiday stories to children. Among that list of memory-inducing ingredients is molasses and as soon as I began to pour the viscous liquid into the batter, I was instantly reminded of the Joe Frogger cookies I made in December. This batter is nowhere near as thick and my hand mixer wasn’t at risk for breakage, but the way the mixture inflated with the addition of the molasses and that distinctive smell reminded me of those wonderful gingerbread cookies. Once the batter was completed and placed into the hot oven to bake, it was time to focus on the lemon sauce. The recipe on the back of the card calls for an egg and, although it is cooked over a double boiler for 15 minutes and the fact that the eggs at my grocery store are safe, the recent egg recall made me a bit weary to serve this particular version to friends. But, this provided me an opportunity to dive into the pile of recipes I’ve pulled out of magazines over the past few months and give one a try. The January 2010 issue of Southern Living featured a recipe for Lemon Hard Sauce with Gingerbread, which didn’t require an egg for the sauce (click here for the recipe). As soon as the tang of fresh lemon hit my nose and mixed with the sweet smell of the sugar, I wondered what the combination of those flavors would taste like with gingerbread. Would it be too sweet? Thankfully I didn’t have to wait long to find out. 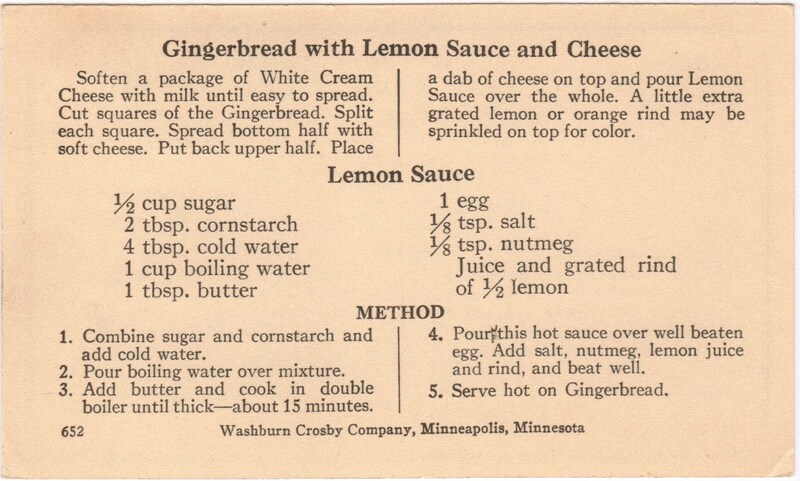 When serving the gingerbread with the lemon sauce, the bread needs to be warm. Not necessarily hot out of the oven, but warm enough to allow the sauce to melt and seep into the nooks and crannies of the bread. I tried the gingerbread both with and without the sauce and although it’s good either way, I really enjoyed it with the sauce. The combination of the sweet, tart sauce with the rich, dense bread is truly divine. I know I keep saying this, but this recipe is one of my all-time favorites from the box. The bread was so moist and the flavor was full without being overpowering. I will definitely be making this recipe again during the holiday season. And despite having to turn on the oven, I’m glad I chose the gingerbread for relief from the heat. Not only did I find a delicious new treat, but recalling some of my favorite family holiday traditions led me on a search to discover that Teddy Ruxpin is making a comeback. Perhaps this year for Christmas, as the adults indulge on gingerbread and Christmas punch, my nephew can listen as Teddy tells him some of the same stories my brothers and I grew up hearing as kids. I see this becoming a new tradition: gingerbread served alongside a holiday story told by a talking bear beneath a twinkling tree.